Lighting, unquestionably, is a fundamental part of design and there are various general trends within interior lighting that remain constant. New technology within the lighting industry, however, means we are seeing a change in terms of design possibilities, as bulb capability and fixtures become more hi-tech. Progress within technology, such as ultra-small downlights, slim but more powerful fixtures, lights fitted with sensors that that react to ambient temperature, is enabling designers to realise new and innovative designs that really succeed in creating that perfect ambience. Technology aside, and looking at aesthetics; current trends are seeing renewed interest in soft coloured lighting with greys and beige leading the way. These two colours are really easy to work with and go beautifully with soft gold, another popular idea in contemporary decor, of both the cosy and urban type. Soft gold can be described in simple terms as somewhere between silver and gold with the lushness of gold as its final overtone, hence its appeal. Modern retro, another popular look, remains in keeping with the harsh industrial theme that has been made sleeker & richer, with a less stark finish for a more refine feel. 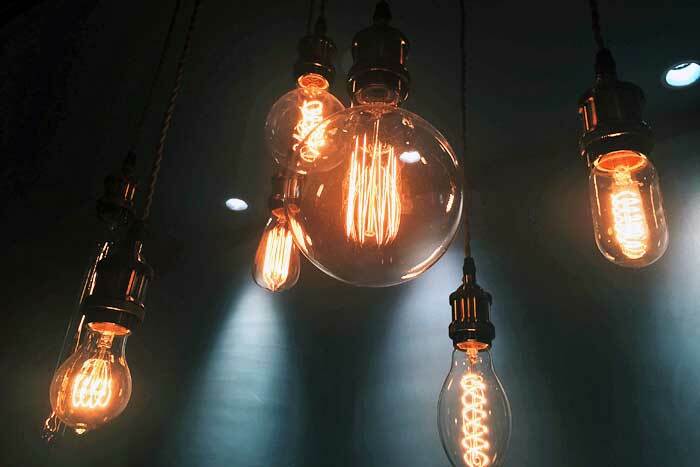 Currently making a splash are Edison-style bulbs. With their squirrel cage, hairpin and spiral filaments they are extremely eye-catching and connect to the theme of modernised retro. The round cone shapes make for a particularly cosy look and the bulbs now come with the added bonus of also being manufactured in LED. Additionally, lighting fixtures themselves are being sculptured into art forms, resulting in a truly attractive look. Cleaner lines and geometrics: circular and triangular tube lights offering both horizontal and vertical sequences have been in fashion of late. The simplicity of the form creates a pleasing geometric statement whether wall or ceiling mounted. Coupled with a variety of beautiful shades of wood finish to complete the look; from walnut, to ash to mahogany, that final wow factor look is achieved. Art Deco lighting has enjoyed years of popularity in terms of interior design with its bold black and white contrasts that create dramatic effect, they can now be toned down though through the use of more natural light shades and low light bulbs. Big fixtures are certainly still creating that knock-out factor although using larger fixtures requires a lot of thought and attention. A large fixture is usually best mounted in the centre of any space for maximum visual effect, with smaller fixtures placed around for balance.